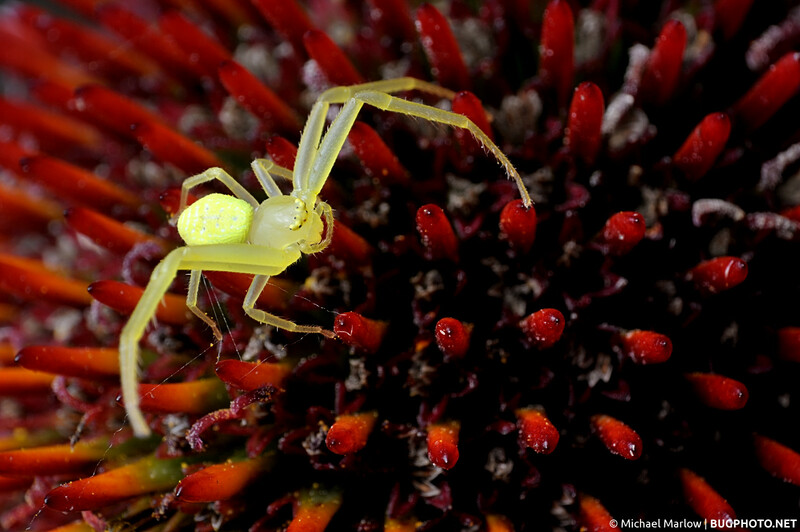 A crab spider lies in wait on the pointy spikes of a cone flower. Avoid the sharp ends, right? I hope it’s a glorious Monday out there for everyone; here’s to some brightness attending it. Posted in Crab SpidersTagged cone flower, Macro Photography, red and yellow, spider, spiky, Thomisidae, yellowBookmark the permalink. Wow. Looks like a toy. Any idea why the crazy coloring? On the spider? Part of it is probably from the way the flash reflects off it, and partly from the post-processing. It was actually overexposed and I had to bring it down and some of the white spots could possibly be toned down. (I made a halfhearted attempt but then gave up on that.) It was definitely the brightest thing in the shot; for whatever reason the abdomen seems to be brighter than the rest of the body in these kind of spiders, too.